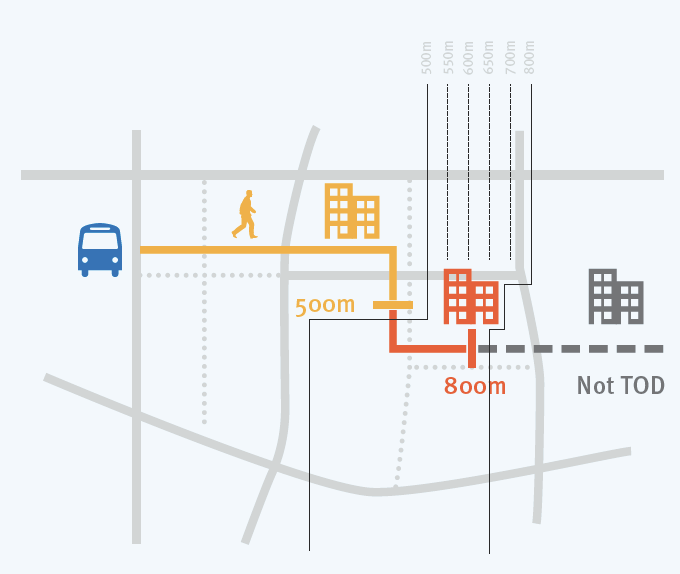 A new TOD scoring system rewards projects that minimize space for moving and storing cars. Image: Institute for Transportation & Development Policy. ##http://www.itdp.org/library/publications/the-tod-standard-version-10##Click to enlarge##. “Transit-oriented development” is probably one of the more abused terms in all of urban planning. Listen carefully in some cities, and you’ll hear urban development professionals calling parking garages “transit-oriented development” without a hint of irony. Last week, the Institute for Transportation & Development Policy released the first draft of a new scoring system that should help identify what really deserves to be called transit-oriented development and what is merely car-centric development pretending to be TOD. ITDP hopes the system will function as an international standard for transit-oriented development — a LEED for TOD, if you will — much like the organization’s standard for bus rapid transit. The “TOD Standard” rates development projects based on factors like residential density and the length of blocks. A project can garner up to 100 points for characteristics that support transit use, while up to 50 points can be subtracted for characteristics that induce driving. ITDP’s scoring criteria are divided into eight categories. The category with the greatest weight is “mode shift,” and it rewards projects that minimize space for parking and automobile traffic. The less space for cars, the greater transit’s mode-share will be. At the Transport Politic, Yonah Freemark set out to see how some American TOD projects measure up according to the ITDP standard. He scored the Lindbergh Town Center project in Atlanta, the NorthPoint project in Cambridge, Massachusetts, and Vienna MetroWest in suburban DC. The MetroWest project scored only 3 points, while Lindbergh scored a total of 39. NorthPoint scored the with a grand total of 63 points. (NorthPoint and MetroWest are not yet complete, and could score higher once they’re finished.) The scores that the rating system produced make intuitive sense, Freemark notes, but he questions whether the standard is based on observed relationships between TOD characteristics and transit ridership levels. For now the scoring system is still in the pilot phase. Next year, after receiving feedback, ITDP plans to adjust the TOD standard and release a revised version and recognize projects that rate highly. It will be interesting to see how American TOD projects measure up. Hopefully, in the meantime, this can be a helpful guide to what should and should not be called TOD. We build parking that nobody ever uses because that's what American engineering standards recommend.